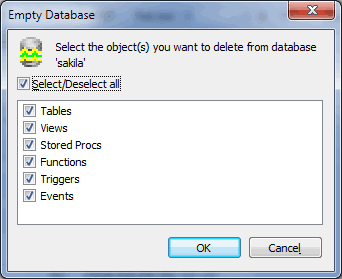 Select Database -> More Database Operations -> Empty Database to drop all the tables and other type of objects (Stored Procedures, Views etc.) of a Database. However the Database itself is not dropped - it remains as an 'empty shell' only. This is practical for import of a SQL Dump with no CREATE DATABASE statement and no USE statement.